In Sticky by Design (part 2) [Listen HERE] we talked about one of the secret ingredients to the stuff that sticks. Jesus was a leader like no other. He clearly and frequently demonstrated to his followers that he had both authority and power yet he never used his authority and power the way others did. He didn't use it to promote himself, or to acquire wealth, or to make a name for himself. He made a radical, even revolutionary decision to use every resource available to him to serve people rather than be served. Jesus was and is a leader like no other! One worthy of our hearts and surrender. Below are a couple of pics from the day. 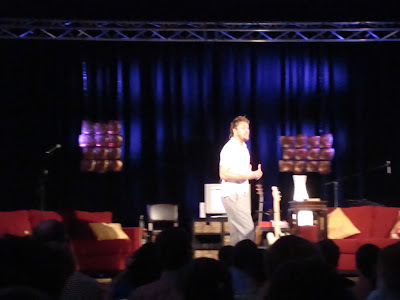 We talked about "the living room" so we created one on stage. Super fun day. 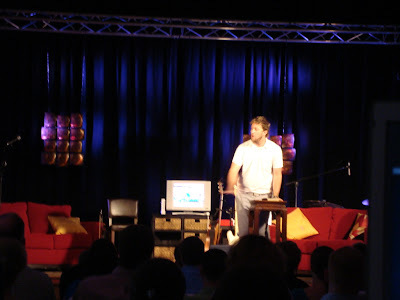 Fun game show and unbelievable worship. Phenomenal response from folks as they crowded the foyer signing up for areas of service at Ridge. 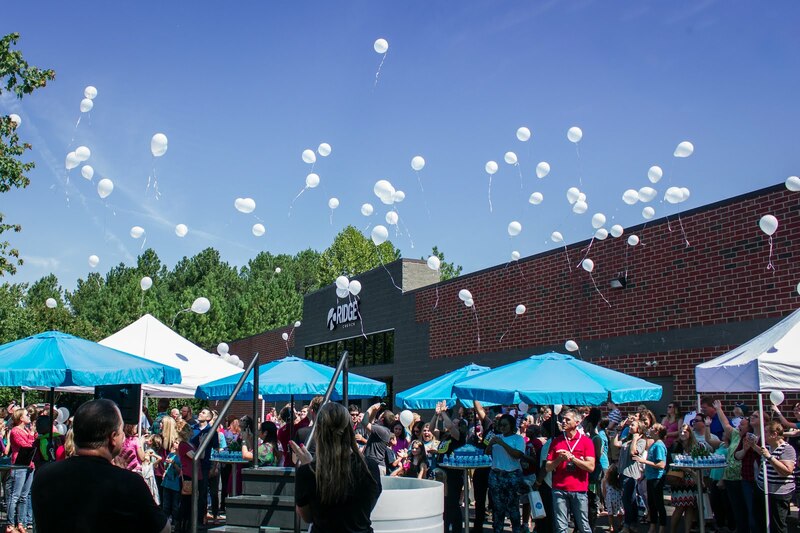 Many new people signed up to serve! We are gearing up for a mind blowing fall. If you missed your opportunity to sign up for strategic service GO HERE to sign up on line. 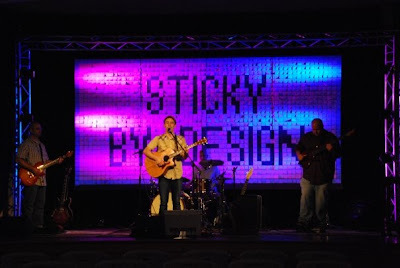 "Sticky by Design" part three coming up and we are doing our third and final game show on stage this week. The winner of this contest will be offered the opportunity to be the stage contestant and possibly win some "sticky fingers stuff." Here is how it works. Go onto the Ridge Facebook Fan Page HERE. 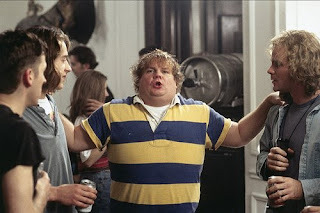 (or in the bar to the right if you are on my blog) Post your favorite movie quote and then get as many of your facebook friends as possible to click the little "thumbs up/I like" icon. The person who's quote gets the most thumbs up will have first chance at being part of the Sticky by Design game show this weekend. Both weeks have been really fun! Tommy: [Tommy and Richard are sitting on a park bench after getting ki cked out of Salinsky's headquarters] I thought they were on my side. Richard Hayden: They figured they had something to gain if the factory was being closed. Tommy: Boy this is the worst. My so called family deserts me. Michelle's mad at me. I've lost the factory, the town's going under and I'm out of a job. Tommy: Could've done without that. Facebook contestants please! We are doing a little competition on the Ridge Facebook Fan Page [Go HERE]. 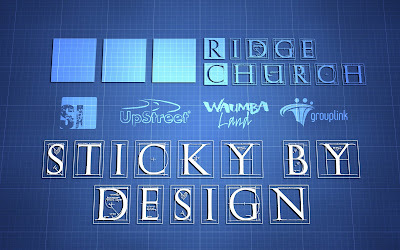 Our current teaching series at Ridge Church is called "Sticky by Design" and we are kicking off each week with a game show where naming the sticky stuff can win you a prize (and make you famous:-) Here is the question: "How many sticky notes were used in the stage backdrop and the bumper video for the series?" The closest guess will land a chance to win some stuff. Just post your guess on the wall of the fan page and we'll see you Sunday! Nirvana "Smells like teen spirit"
Lynard Skynard "Sweet Home Alabama"
It was a very entertaining and memorable day. Rusty did an amazing job with some of the creative elements. Here are a few pics and the title package. 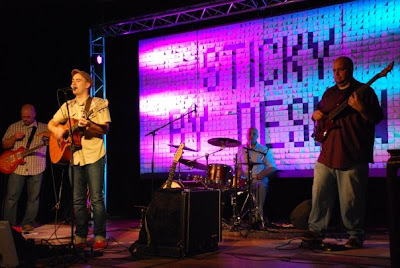 The stage backdrop is made entirely of "Sticky Notes." Some advertisements or slogans stick in our minds while others don't. Some commercials are memorable while others are quickly forgotten. Some marriages seem to stick while others don't. So what is the secret to stuff that sticks? This three part series, "Sticky by Design" will discuss several principles that you will find not only in organizations and products that have become "sticky" but also in homes and marriages that stick. And this series is going to be very, very memorable. We have a ton of helpful, fun and funny stuff in store.